Home » Will Rajon Rondo Be Fit For Opening Day Of 2014/15 NBA Season? Will Rajon Rondo Be Fit For Opening Day Of 2014/15 NBA Season? 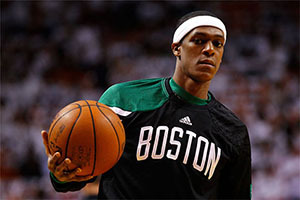 When Rajon Rondo, the point guard for the Boston Celtics, was diagnosed with a fractured left hand, the player was written off for the early part of the campaign. The injury was supposed to keep the player out for 6 to 8 weeks, and with the injury coming as the Celtics were stepping up their pre-season training, most people around the club believed that they would be without the player for a considerable period of time. There has been a change in attitude of late though and coach Brad Stevens has said that there is a chance that the player will be available for selection on the opening week of the season. Rondo received good news last week at a re-evaluation showed that there has been considerable progress made by the player. However, he has not yet received clearance for contact play and with the Celtics starting their campaign on the 29th of October, against the Brooklyn Nets; time may be running out for the player. I don’t know. I still haven’t had any contact yet. The opener is a little bit over a week away. I don’t want to set goals; I just want to go as my hand heals. It is expected that the player will be cleared for contact in the next couple of days, and then it will depend on how comfortable the player feels. Some players are not at their best dealing with the psychological impact of playing with an injury and there will be a need for Rondo to show that he can handle the ball and dribble as normal. The player has intimated that he can catch and dribble as normal but these aren’t the things that the player needs to focus on. The main issue is what sort of impact will have a fall to the floor or hitting the lane have on the injury and this may be the factor that decides whether Rondo is able to play in the opening game of the campaign. If the player wears specialist padding, it will need to be approved by the league, and this seems to be the aspect that Stevens is pinning his hopes on. If the player is willing to play and the league has no issues with the padding that is worn, you can expect Rondo to be in and around the opening match for Boston, and this will just mean that the speculation around the player will switch to a different matter. There has been a great deal of trading rumours and speculation surrounding Rondo in recent weeks and months, and this isn’t going to go away just because he is playing with an injury. There is a lot of talk that the player will soon become available and with no rumours of an agreement of a deal with the Celtics in the offing, the clock could be ticking on the players career in Boston.